A recent video of former NBA superstar Michael Jordan and Patriots quarterback Tom Bradly having a good time of playing Basketball that showed up this weekend on Instagram. While Michael Jordan and his friends are hanging out in the Bahamas, Jordan showed off some of his skills while talking some trash in a pickup game with Tom Bradly. Michael Jordan, retired in NBA in 2003, as a Washington Wizard, but he will be remembered as Chicago Bulls player which he got 6 NBA Champions , 6 Finals MVP and 5 regular season MVP. Michael Jordan was considered as “the greatest player ever played the game of basketball of all time”, and at 52, I had to admit the guy still got it,The video in Instagram shows that Michael Jordan, takes a jump shot and makes it, I am not surprised of he making the shot, for crying out loud he is “Michael Jordan”. I would be surprised if he missed it. Jordan also shows some dribbling ability as he penetrate and take the jump shot, after he made the shot he give some trash talk to Tom Bradly and others. Aside from being a prolific scorer, during his prime, Jordan is also considered as one of the greatest trash talker in the game of basketball. a certain tactics used to irritate the opponent player during in the game of Basketball. The video was recorded by unknown woman in the background, while watching Michael Jordan and the company playing Basketball. Currently Michael Jordan, own’s the NBA Team Charlotte Bobcat’s, who are fighting their chances to make it to the eastern conference playoffs. 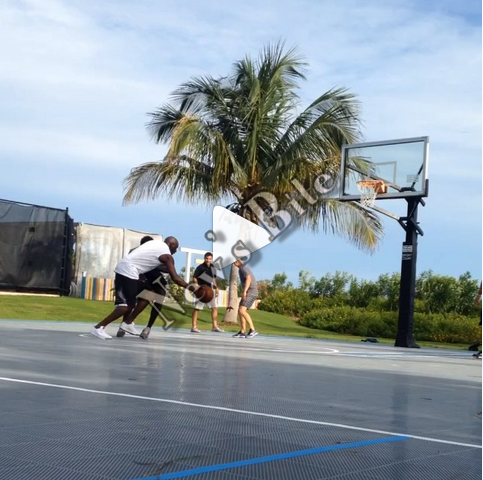 No Comment to " Watch: Michael Jordan Shows Some Skills At Age 52, While Playing With Tom Bradly "